William H. Simpson was born in Woodstock, Canada December 11, 1851. He moved with his parents to Wayne Michigan as a young child and received his education there. In 1881, he came to Mandan, Dakota Territory while he was working as a conductor of the work train that handled materials for the construction of the Northern Pacific bridge over the Missouri River. Leaving the railroad in 1884, he went into partnership with Pat McBillic in the grocery and general mercantile business. This business was dissolved in 1892 when Mr. Simpson established his own store, which he later sold to John Foran. In 1890 he went back to Wayne Michgan and married Miss Elizabeth Ann Stephens on February 13, 1890. Elizabeth was the daughter of John H. and Elizabeth (Bishop) Stephens. She was born April 23, 1865 at Clifton Michigan. Elizabeth was one of twelve children. Her father, a mining engineer at the Clifton Cooper Mines died before she was born. Her mother died in 1874. She was reared and educated at Wayne Michigan by an uncle William Noble, a minister there. 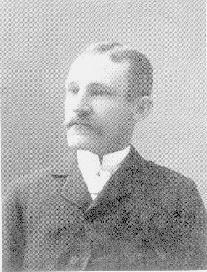 Mr. Simpson was one of the organizers of the Farmer's and Merchant's State Bank in 1902 and served as vice president and president of the institution. When Fort Abraham Lincoln was abandoned. President Grover Cleveland deeded the property to Mr. Simpson. His daughter, Mrs. Bergenson, has the original deed. He was ever prominent in public affairs in the early days. He was Republican legislator and served threee consecutive terms starting in 1903. In 1904, upon the death of then acting postermaster, Mr. Simpson was given an interim appointment and was appointed postmaster from 1909 to 1913. He was for many years a member of the State Fair Board and was on of the organizers of the Missouri Slope Agriculture and Fair Association. He was also active in Mandan's volunteer Fire Company No. 2. Mr. Simpson was also active in the real estate business and a partner in the cement contracting business with Oscar Edwards. Mrs. Simpson was a very active woman in the Mandan community. She was best known for her work in musical circles. She often appeared as a soloist at the musical programs. Her home was always a center of musical gatherings. 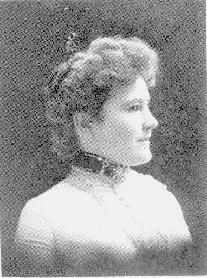 She was a member of the Mandan Park Board., the Presbyterian Church, the Eastern Star and Mandan Reading Club. Mrs. Simpson like her husband, was also active in the real estate business and a partner in the cement contacting business with Oscar Edwards. William and Elizabeth Simpson were the parents of three daughters; Mrs. Genevieve (Thomas J.) Lough of Detroit, MI, Mrs. Evelyn (R. M.) Bergeson of Bismarck and Mrs. Willifred (Harry) West, Laguna Hills, CA. William H. Simpson died on February 23, 1929. He is buried in Union Cemetery, Mandan.